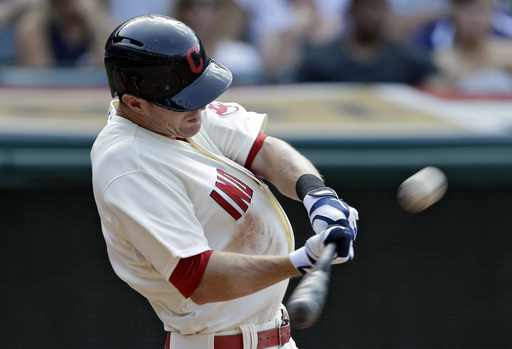 It wasn’t always pretty, see their four errors, but the Cleveland Indians pulled out the series win on Sunday as Drew Stubbs hit a home run in the bottom of the eighth inning and and the Tribe went on to win 3-1. After going 6-3 on their recent road trip, the Indians came home and took two-of-three from the Twins. That leaves the Indians heading into Monday’s off day just 1.5 games behind Oakland in the chase for a Wild Card spot. It doesn’t seem to matter if the national media write off the Indians, or if the fans can’t seem to get behind this squad, this team seems determined to find a way to stay in the playoff hunt. The Tribe has once again worked itself into the playoff race thanks to its starting pitching. Sunday, it was Scott Kazmir’s turn and the lefty worked six innings, giving up one run and striking out eight. The day before that, Zach McCallister went 7.2 innings, giving up two runs and striking out five. Before him, Ubaldo Jimenez struck out 10 in six innings and only gave up two runs. Before that … well, you get the picture. It seems like we say this every week, but this next week is going to be a big one for the Tribe (and with 32 games left on the schedule, we may need to repeat that phrase a few more times). The Indians hit the road for three-game series with Atlanta and then Detroit, before coming back home to take on Baltimore, one of the teams the Tribe is competing against for the Wild Card. It’s a big if, but if the Indians can keep pitching the way they have, and keep getting the right hit at the right time, they may actually have a chance to make it out of this nine-game stretch in good shape. And after watching the ups and downs of this team all season, we are pretty much prepared for anything out of this team. The Cleveland Browns had a very retro look on offense in their preseason friendly against Indianapolis on Saturday – and that is not a good thing. The offense had a very 2012 feel to it, with missed passes, multiple three-and-outs and general ineffectiveness. Depending on which side of the “it is only preseason” spectrum you reside on, it was either no big deal or a sign that the first two preseason games were just a mirage and Browns fans are in for another long season. 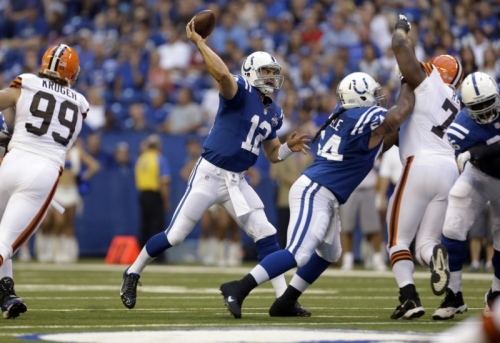 As good as Brandon Weeden looked in the prior two games, it he looked just as bad against the Colts. In his first game after being named the starting quarterback, Weeden was just 12-of-25 for 105 as the first-players stayed on the field into the third quarter. He never looked comfortable at any time on the field and, as a whole, the Browns offense had a very Brian Daboll/Pat Shurmur vibe to it. Cleveland did not make it into the red zone the entire game, was just five-of-16 on third down, the first-team offense only ran three plays in Colts territory (and one of those was a punt), and walked out of Lucas Oil Stadium with just two Shayne Graham field goals. Things were bad enough that Chudzinski is at least considering having the starters play some on Thursday night against Chicago, a game where the first-teamers generally get the night off. If Chudzinski decides to have the starters play some against the Bears we’re all for that. They certainly looked like a group on Saturday night that needs more time before the games start counting for real. That looming decision puts Chudzinski in a bit of a tough spot. If the starters sit out against the Bears, it will be 15 days before they take the field again and if they come out rusty in the season opener, Chudzinski will be criticized by some. If he plays the starters in Thursday’s game and someone gets hurt, he will be criticized by some. But that’s why he gets to wear the big-boy headset on game day. 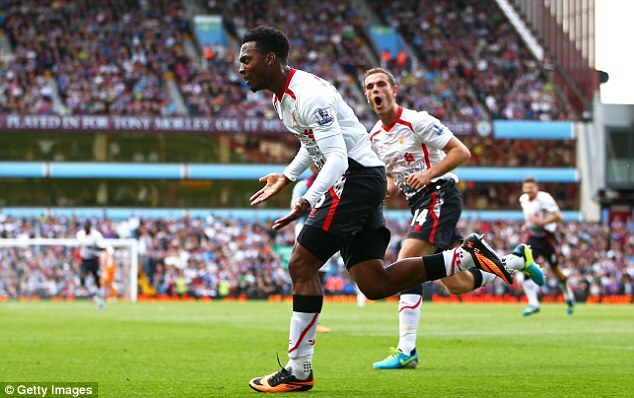 Liverpool did it again on Saturday, riding a Daniel Sturridge goal to a 1-0 victory over Randy Lerner’s Aston Villa. It is the first time in five years that the Reds have opened the season with consecutive victories. More importantly, the team is now 5-0-1 while Luis Suárez serves his 10-match suspension. “It’s still very early. What was important for us was to make a good start,” manager Brendan Rodgers told Sky Sports. “We didn’t have a good start at all last year, it took us until the end of September to get our first win, so I just think that since the turn of the year, since January, we have got better and better. Sturridge has now scored seven goals in his last four games, and his game-winner on Saturday was the type of goal that only a striker who is gaining confidence with every match would even consider taking. We’re not saying that Liverpool is better off without Suárez. (Wait, we’re not saying that, are we? No, we don’t think we are). But they are making the most of the time that he is away from the club, which is something we are going to expand on later this week. For now, it’s enough that Liverpool is sitting at the top of the table ahead of next Sunday’s home clash with Manchester United.